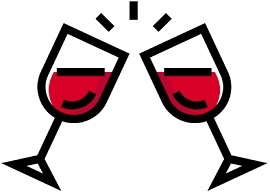 Need to give a toast at an upcoming event, but afraid you'll mess up and forget what you want to say? Memorize your toast beforehand using memory techniques! I did just that this year at Thanksgiving. We were invited to a neighbor's for Thanksgiving dinner, and in the invitation our host hinted they would go around the room asking for toasts before the meal. I am petrified of public speaking, so right away I got that sinking feeling. What if I stand up, then from nervousness can't think of what to say? Or what if I do know a great toast, but forget the words under the pressure of all those staring eyes? Well, it had a happy ending. I memorized a toast beforehand (see below on how I did it), and when it was my turn recited it perfectly. Those who know me don't expect much in the way of social speaking, so the entire group of about 12 family and friends were astonished and amazed. So let me share with you how to use memorization techniques to commit a speech or toast to memory. I'll use my Thanksgiving toast as a real-life example of the power and effectiveness of these methods. Then try this yourself! Lots of holidays and events provide an opportunity for a quick yet memorable toast. New Year's, Christmas, Thanksgiving, weddings, graduations, and just about any other celebratory gathering can be your moment to shine. The first step to memorize a toast is, of course, to decide what you want to say. You can either write a toast from scratch, or find a pre-written toast on the internet and modify it to suit your needs. For example, my neighbor gave a fine toast off the top of his head giving thanks for family, friends, and so on. He has that skill, of speaking well without notes or prepared remarks. So he didn't need to memorize his toast beforehand. I, on the other hand, knew I'd better prepare my toast in advance and make sure I had it down cold in memory. So I searched on the web for a few minutes, using keyword phrases like "best thanksgiving toast". I found one on etiquettescholar.com that I really liked. I've reproduced it below. Once you've decided on the main part of your toast, the next step is to copy it into a Word document or write it down on paper. Then, modify the toast if necessary to for your situation. For example, you might want to add personal details or even merge two different toasts together. After slightly editing the original Thanksgiving toast I found on the web, here's the toast I ended up with. This is the version I committed to memory using the technique described below. And the other a piece for all our plates. Here's to the friends we hold so dear. As we celebrate this Thanksgiving Day. Cheers! Notice the first paragraph includes a bit of humor, while the second is a bit more serious. I thought that was a fun touch, to mix the two. I didn't forget my toast, because I used images links to set "sign posts" in my mind for the main parts of the toast. This is the key to memorizing long passages of text, including toasts and speeches and even poems. You can probably memorize a basic short sentence or phrase simply by repeating it. So when memorizing a toast, that's not where the difficulty lies. Both these issues can be solved by establishing visual mental sign post markers. During the process of memorization, identify which keywords in the toast are hard to remember, and think of a memorable image for them. Then link each sentence to the next sentence with another set of visual markers. Here's how I did this with the toast I wanted to memorize. This is the thought process I went through as I memorized the toast the night before. To recall the title of the toast, and to act as an anchor to begin, I imagined a Thanksgiving turkey standing in front of the group waving a giant piece of toast. "Two Birds: The American Eagle and the Thanksgiving Turkey"
Using the Link Method, I pictured an eagle and a turkey fighting over a piece of toast. 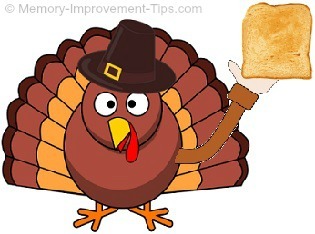 When I think of the first image, the turkey waving the toast, I'm reminded of the second line about the two birds. That line is short and easy to remember with some repetition. And the other a piece for all our plates." These two lines rhyme, which helps with recall obviously. I imagine the eagle from the second toast image handing a sprig of laurel (a recognized symbol of peace) to a map of the United States that has arms and legs and a smiley face on it. When using image-based memorization techniques, it's quite common and useful to imagine inanimate objects like the map as "characters" performing actions. It's weird, and that's why it is memorable. For the second line of the rhyme, I imagine the turkey placing a cut-out state (like from a United States jigsaw puzzle on a giant silver plate. Notice how one set of mental images links to the next using a particular keyword: toast, eagle, state, plate. "Here's to the blessings of the year"
I imagine a tiny priest standing on a silver plate sprinkling holy water (i.e., blessing) a calendar which represents "year". "Here's to the friends we hold so dear." I imagine a huge crowd of my friends dressed as priests chasing after a deer. "To peace on earth, both far and near." I imagine a heard of deer running far and back around the earth at high speed, causing the earth to fall into pieces. "As we celebrate this Thanksgiving day. Cheers!" I see pieces of the earth falling into a giant champagne glass. If you followed along with that, you'll notice I didn't need to create a mental image for every single word of the toast. All the brain really needs are "hooks" to remind it of what to say next. That, combined with space repetition practice, will get the job done. One more tip: You can increase your chances of remembering by practicing your toast out loud. Find a quiet room in your house, and actually stand up and recite your toast, delivering it at the same speed and loudness you expect for the real toast. If you make errors during recitation practice, correct these by improving your mental images and by making them clearer. Some times it helps to sketch out the images on paper. You don't have to be an artist to sketch mental images that work. They just need to be good enough for you personally to recognize the image and what it represents. Of the many memorization techniques available, I find the Link Method the most useful in this regard for toasts. A last word of advice on delivering the toast. Because you know you have the toast memorized, you might accidentally rush through the delivery, trying to get it all out before you forget it. However, this is a mistake. Remember, your audience hasn't heard your toast before. If you hurry through it, they might not understand it, or miss some of the deeper meaning of it. You went to all the trouble of writing and memorizing your toast. Don't waste it by zooming through it. Instead, recite it slowly, deliberately, and very clearly. And make sure you speak loud enough for everyone in the room to hear you. At your next event, knock 'em dead with an amazing and unexpected toast. And be sure to use memory techniques, as I did, to make sure you don't forget the words. Good luck!